Previous Subscribe to Our Newsletter, Win a Black Balloon Book Bundle! There’s always that one book you see every time you go to a thrift shop — biographies of George Bush, vampire romance novels for teens, stories about dead pets. Jewel’s A Night Without Armor was mine. I’ve seen so many copies of her collection of poetry at Salvation Army that I could start my own library. Back in the day, I mocked it so much that my friends started buying copies too, giving Jewel her 15 minutes of literary fame in suburban Michigan. Though most celebrity novels tend to be as — or more — cringe-worthy than Jewel’s, some are actually worth reading. The latest celebrity to impress the literary world is comedian B. J. Novak, whose short story collection, One More Thing, has been greeted with generally positive reviews. In honor of his ability to manage what few others can, here’s a (Jewel-free) list of novels written by celebrities that are good for more than their embarrassingly bad poetry. Most of us remember Wilder for his creepy performance as Mr. Wonka in Willy Wonka & the Chocolate Factory, but after his days of oompa loompas were over, the actor took up writing love stories — and was actually pretty good at it! The Woman Who Wouldn’t, which tells the story of a 1903 violinist looking for love, was deemed “poignant and whimsically romantic” by Publisher’s Weekly. Wilder even gives Chekhov a cameo in the novel, illustrating that he knows as much about literature as he does about Wonka Bars. If you’re one of those people who (rightfully) believes that the book is always better than the movie, rejoice: Although the film adaptation of Martin’s novel wasn’t a success, his book received rave reviews. The story of a lonely store worker, Shopgirl is a surprisingly sad pursuit compared to the rest of the comedian’s work. Martin should actually consider making the jump to tragedy in film as well, as Shopgirl spent 15 weeks on The New York Times bestseller list. Laurie is sort of like an older, less embarrassing version of James Franco in that he dabbles in multiple forms of art outside of his acting career. When he’s not starring on House or playing hits from his latest blues album, Didn’t It Rain, Laurie is writing spoofs on spy novels for teenagers. 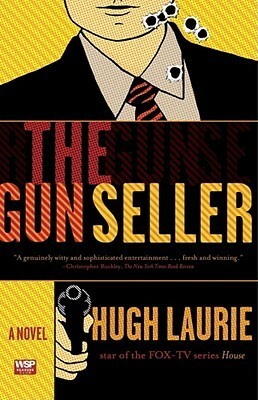 The Gun Seller, his first, was called “engaging” and “pleasantly different” by School Library Journal. With plotlines that would make even Roald Dahl cringe, Burton’s work tells the stories of outcast children, like a character named Mummy Boy who meets a tragic ending when he’s mistaken for a piñata. For all its gruesomeness, The Melancholy Death of Oyster Boy has touching and humorous moments, too; Burton writes of a character named Brie Boy: “The other children never let Brie Boy play ... but at least he went well with a nice Chardonnay.” Although all the stories in Burton’s book are about children, make sure you don’t save this one for a bedtime read for your first-grader. While not a huge celebrity, Ferguson is on TV enough that you might have doubts about his novel-writing capabilities. Between the Bridge and the River tells the story of two Scottish childhood friends and two Southern illegitimate half-brothers on a bizarre journey during which they encounter everyone from snake handlers to dead historical figures. If Ferguson’s book sounds weird that’s because it is. But it’s also surprisingly poignant, and as any novel that features a main character obsessed with both alcohol and knitwear must be, it’s hysterically funny. It’s surprising enough when a celebrity writes a well-received book, but when that well-received book happens to be Biblical fiction, that’s when things really get interesting. Cash’s work tells the story of the Apostle Paul and his conversion while journeying to Damascus. Though the plotline might not thrill you, keep in mind that Cash’s book has accomplished a feat nearly impossible for any novel, let alone one written by a celebrity: not a single one-star review on Amazon. When so much of celebrity writing falls into the category of Pamela Anderson-level literature, what is it that makes actors and singers continue to their forays into the world of letters? After all, the author-turned-celebrity turnover rate is pretty low. (Imagine Zadie Smith guest-starring on Baywatch.) Maybe it’s because writing, like acting, is essentially storytelling and self-absorbed celebrities think their experiences with fame and fortune make them far more exciting narrators than the average would-be writer working a day job as a dog-walker? But what so few of them fail to grasp, though, is that what readers are really interested in are stories — like the ones listed above — that we haven’t seen on the covers of tabloid magazines. Adina Applebaum is Michigan native studying English and creative writing at Barnard College. Her crowning achievements in life are memorizing the entirety of lyrics on the Slim Shady LPand eating a gallon of chocolate-covered raisins during orientation week of college.